There may be times in your working life where you’ll fancy a career change. This, in turn, could lead to you being perceived as ‘overqualified’ for the job you’re interested in. 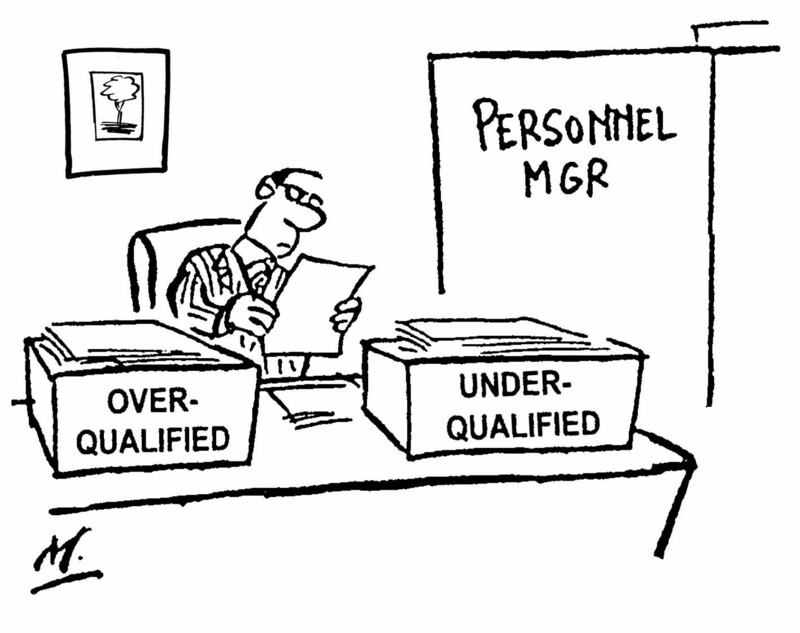 It is frustrating to be told you’re overqualified for a job when you know, deep down that you’re the perfect candidate! Being overqualified can actually present more problems than you originally thought as many recruiters will think of you as someone looking to go down a level as result of either low self-esteem and/ or low value. They may also have other suspicions as to why you’re interested in a certain position. Tone down job titles / achievements / keywords in your CV. If your CV is full of industry-specific key words that relate to I.T. and you’re now applying for a retail position, try and tone down the content so that any irrelevant details are not included and use the space to showcase transferable skills instead. Format your CV in a way that detracts the focus away from your qualifications (maybe include them lower down in the CV) and use more space to highlight all relevant skills and experience instead. Use your CV to demonstrate to the recruiter that your skills are directly related to the company’s growth plans and that you’re looking to develop with the company. Accentuate your team working skills. Doing so will demonstrate the success of the team (and the company) is of more importance than your own concerns. Demonstrate your enthusiasm throughout the CV for the industry you’re interested in. Maybe you could tailor your previous responsibilities / achievements in a way that focusses on the job you’re applying for? Following recent redundancy or after a long period of unemployment, it is all too easy for people to become disheartened and start applying for any job just to ease financial worries. This will then lead to you looking desperate and will significantly reduce your chances of employment. I have recently finished working at BT (where I have been in a senior management role for 22 years). I am now retired but am interested in a part time vacancy at a local garden centre. Do I stand any chance of getting the job? We often create CVs for clients who are near to / have retired and are looking for part time employment to fill the void. In this situation, you’ll probably need to explain why you’re applying for a job you’re well overqualified for in your covering letter. You could also explain in more detail during an interview situation. Can being paid a lot more in a previous job be classed as ‘overqualified’? Yes. There are numerous reasons behind companies placing you in the ‘overqualified’ bracket. These could be: previously having a larger salary, having too much experience in a specific industry or purely having too many qualifications. Why would someone worry about me being overqualified? I believe, with my experience, I can do nothing but benefit them! Although this is probably true, recruiters will worry that because you’re overqualified, you may get bored easily in a lesser position. In addition, they might worry that you’ll become unsatisfied with a lower salary and will leave the company as soon as a better job opportunity arises. I have an interview coming up and, as with most interviews, I am worried if I am asked about my salary expectations. Don’t worry – all you’ll need to do here is highlight the fact that you are willing to accept a lower salary than you’ve enjoyed in the past to take up a position that you’re passionate about. If I am asked directly in the interview about being overqualified, what should I say? Rather than replying with an answer which can come across as being defensive, ask the interviewer what they actually mean by being ‘overqualified’. After this, you can respond appropriately.